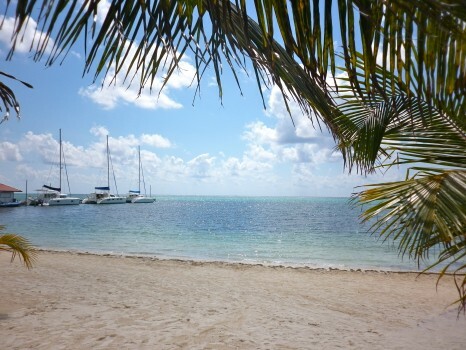 Ambergris Caye is one of those types of places that are just timeless. I first visited in 2003 and spent 3 awesome days there. Fast forward 9 years and I spent another 3 awesome days. A lot had changed but most still remains the same. 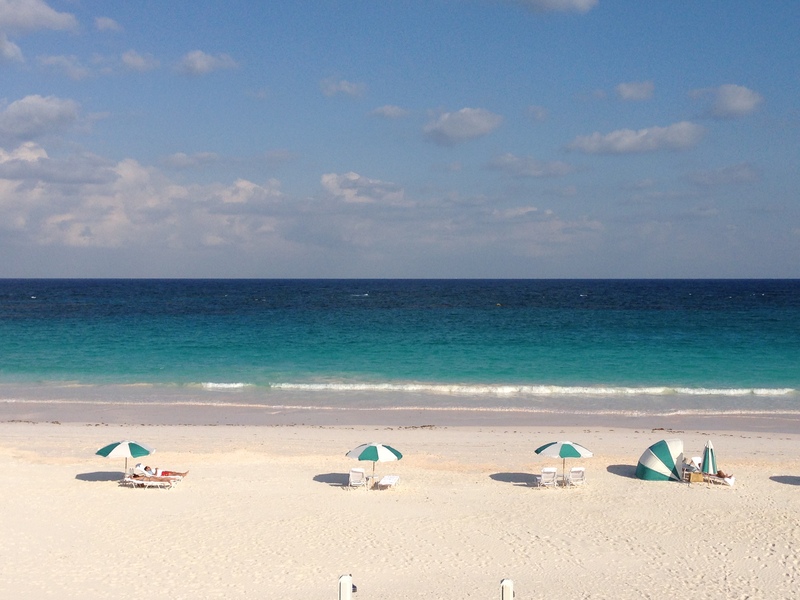 Ambergris retains its charm and stunning natural beauty while only slightly selling out to mass tourism. The first thing I noticed when I got out of the small airport in the middle of San Pedro town is that the roads are now paved. Nine years ago, no roads were paved. In fact, my friend Jake and I didn’t even wear shoes for the whole time we were on the island. I must say the paved roads are a nice addition but it also has brought a lot more traffic and when I say traffic I mean golf carts. 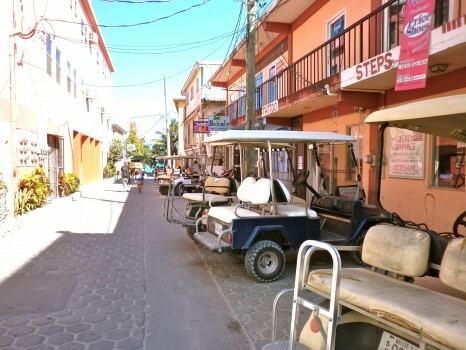 There are very few cars on Ambergris Caye but each of the resorts offers golf carts to its guests. Additionally, you can rent them all over town. I preferred to stay in town as I did the first time I was on the island so I could walk everywhere. I don’t want to have to taxi or golf cart every time I want to go into town. Turns out it worked out great…as usual. 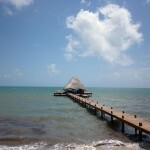 I stayed at Ramon’s Village in San Pedro right on the beach. 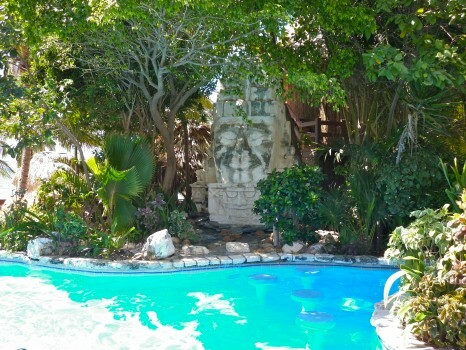 It is a beautiful little property that I had actually used the pool at the first time I was on Ambergris. We didn’t stay there the first time because it was too expensive. The first time I visited I stayed at a place called Ruby’s, which I pointed out to my friend who said, “You actually stayed there?” It was fun at the time but Ramon’s is definitely one of the best places to stay in San Pedro if not the best. 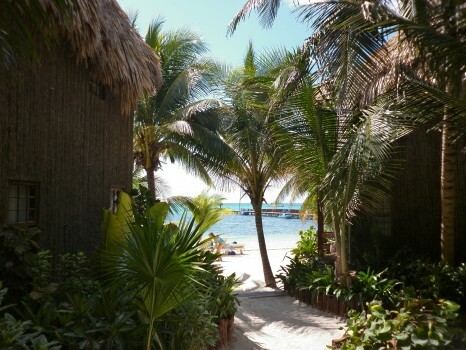 You can get awesome huts for one person up to a family suite on a great beach, with its own dive shop and pool being overlooked by a large Mayan God. If you tire of pools, beach, hammocks and laying out then head into town and walk the streets for some cheap good, even cheaper drinks and amazing food. My personal favorite local import is pupusas. 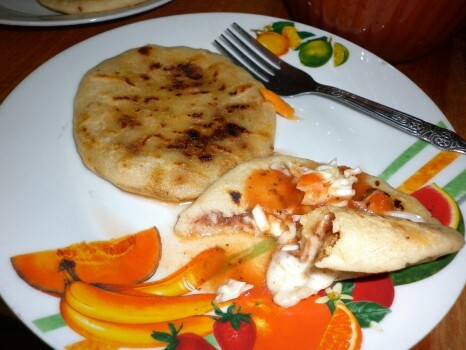 Pupusas are a Salvadorian favorite made from cornmeal pancakes filled with whatever you want inside. My favorite is the mixed pork, beans and cheese topped with cabbage, some tomato sauce and hot sauce. It is served piping hot and is absolutely delicious. The two best places in town are directly across the street from each other. I kept saying they were dueling pupusas. It reminded me of Philadelphia where you have Pat’s and Geno’s across the streets from one another and you almost have to try both but everyone prefers one. 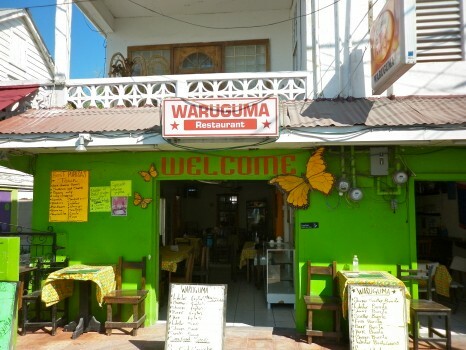 I must say they were both great but I am going with the original Pupuseria over Warugama by a hair. 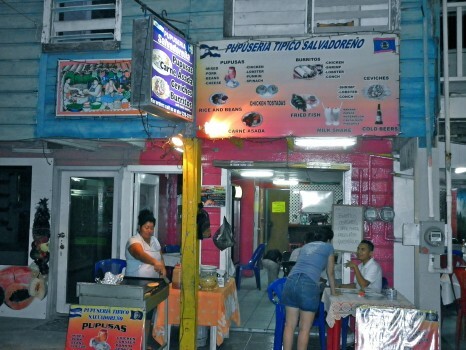 It’s third generation Salvadorian and the people were very nice to us. By the way, pupusas are extremely cheap as well. 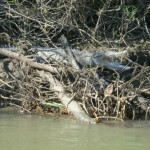 Like most food on Ambergris. The best restaurant on the island as was recommended to me by several people was Mango’s. It is right on the beach, ironically right next to Ruby’s. 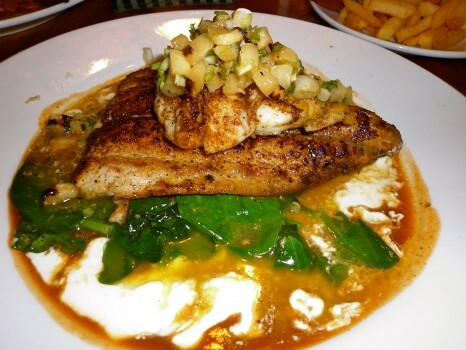 I had a wahoo fish that was easily the best I’ve ever tasted and it was prepared so intricately with pineapples, a delicious sauce and accompaniments that it was just perfect. I highly recommend it. 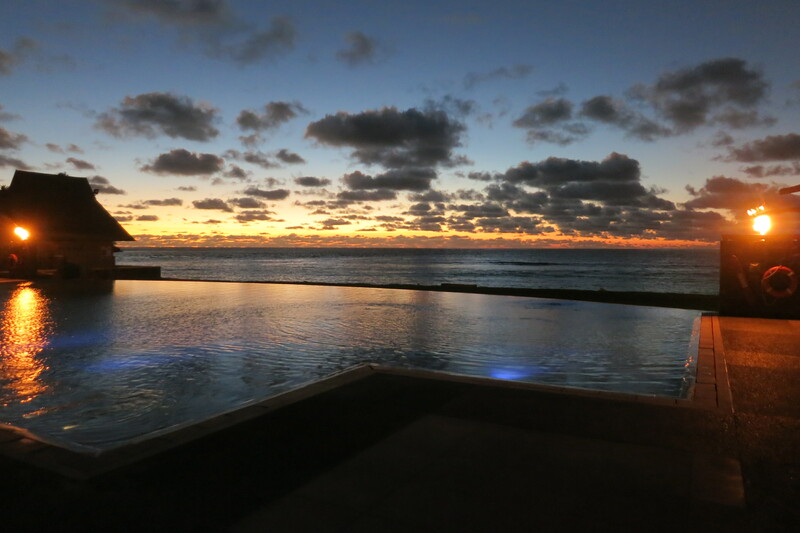 As far as nightlife on Ambergris, there are a few places to head out to but nothing to crazy. 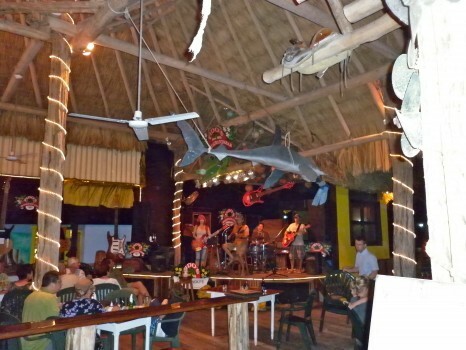 It’s a live music kind of place with light 70’s rock or reggae playing at all times. My favorite was Fido’s; which is a bit of an Ambergris landmark. I actually remember going there back in 2003. They play great music and have a friendly staff whose sole joy in life is getting you drunk if you sit at the bar. 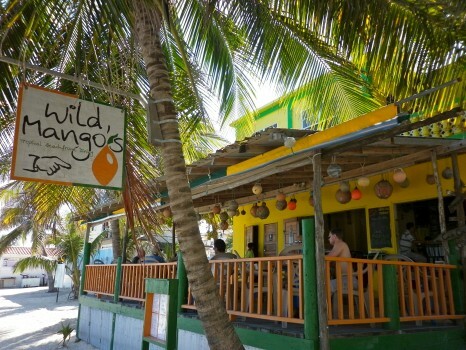 Along with relaxing at the beach or just simply walking around the streets of San Pedro, the other great pastime of Ambergris Caye is diving and snorkeling. 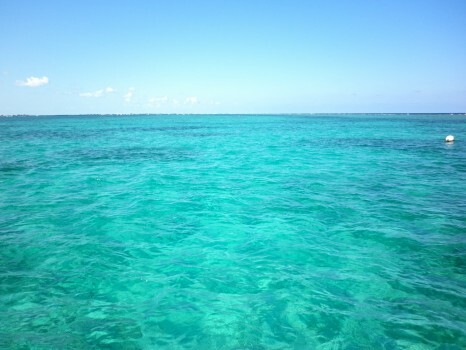 The world famous Blue Hole is a few hours boat ride out from Ambergris. 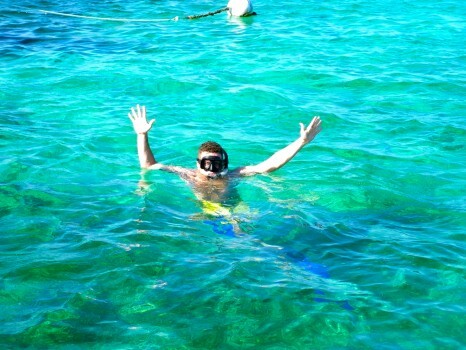 We however, decided to do some snorkeling at shark ray alley, which was pretty cool. You are literally surrounded by sharks, rays and huge schools of fish and coral. You are able to hold and touch rays and sharks; which is both cool and weird at the same time. Our group was an interesting mix of people. You can’t always pick your group; which is what makes doing group tours a bit of a gamble but once everyone got in the water, it was all about the gorgeous scenery. I wish I had an underwater camera to show you how cool it looked but you’ll have to take my word that it was pretty awesome. 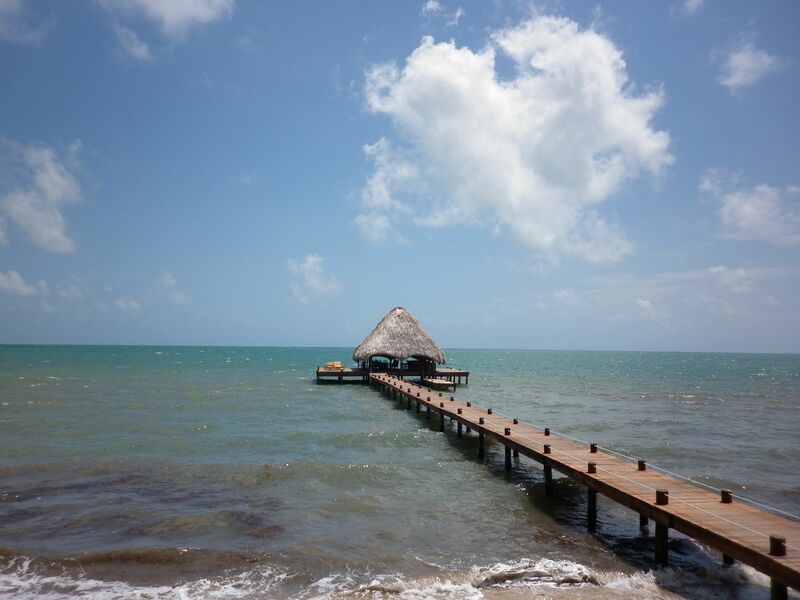 Ambergris is the Belize you hear about and see on television. 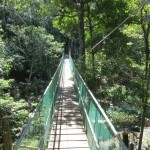 It is as touristy as Belize gets but it’s still not that touristy. 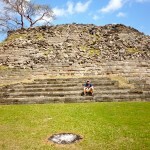 Real estate developments are still affordable from what I saw and it still has its hole in the wall places to experience the real Belize and neighboring country’s foods. 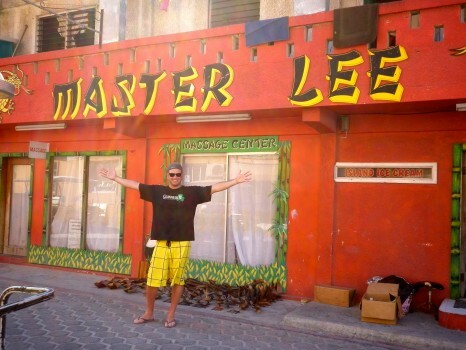 I love that and I love Ambergris Caye. I hope I don’t wait another 9 years before I go back again. I am now in Newport Beach, California for a few days before I head out to French Polynesia for an epic 3 week adventure! 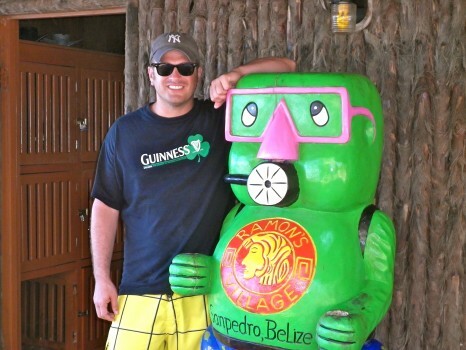 I love love love Ambergris Caye! Hi Lee, I’ve stayed ar Ramon’s as well. 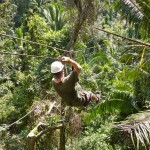 A great place to stay and convenient to everywhere in town as you mentioned. Thanks for bringing back some fond memories. One of my readers Terry, just had an awesome email I had to share…the comment was simply pupusas rock! Indeed they do Terry! Looks gorgeous!! 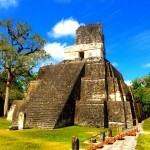 My wife and I want to go to Belize for our 10th anniversary coming up this month, but not looking possible due to Central Asia visa problems (it is likely passport will be at some embassy that weekend).